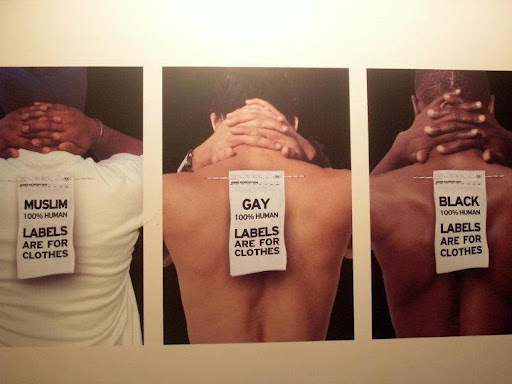 Wouldn’t the world be a wonderful place if we could shed labels like black, white, Latino, Asian, gay, bisexual or lesbian? We like to imagine — assume, even — that humanity will only ever continue to progress socially and technologically and that one day such distinctions will blur into a pleasant haze of meaninglessness. Are labels really necessary? We se them all the time, but should we? This entry was posted on Friday, September 14th, 2012 at 6:50 am	and posted in Uncategorized. You can follow any responses to this entry through the RSS 2.0 feed. It's time for that to happen. I think events in the mid-east these days are a good example of why. Back in the mid 90's I established at my work place (or elsewhere) that my sexuality was 'not a topic'. If you weren't there then you didn't really need to know. Nothing about that has changed.Life without labels is like being whole with your own mind. Own it.